Cottage Rose 14x34 white runner Heritage Lace. 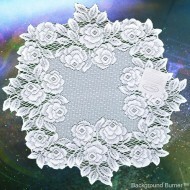 From the Timeless & Classic Gallery of Heritage Lace comes this pattern called Cottage Rose. If you have Victorian decor, this is a must for an added touch of elegance. A lavish rose border gives this collection a fresh go anywhere versatility. Care: Machine wash cold, gentle. Do not bleach. Hang or lay flat to dry. Touch up with a cool iron if desired.